The World Trade Organization (wto) ruled on October 15 that the us has failed to bring subsidies and export credit guarantees to its cotton farmers in conformity with wto rulings. The ruling is a major victory for Brazil and four West African countries--Benin, Burkina Faso, Chad and Mali--which claimed to have been seriously affected by the trade-distorting subsidies of the us government. Following the ruling, the us could now face up to us $4 billion in trade sanctions by Brazil--the world's fifth largest exporter of cotton--that had filed the case against the us subsidies at wto . The Brazilian government says the us only retained its place as the world's second-largest cotton exporter by paying out us $12.5 billion in government subsidies to its farmers between August 1999 and July 2003. Officials in developing countries and international poverty analysts criticized the handouts for driving down world cotton prices and making it hard for small farmers in developing and poor countries to compete in international markets. 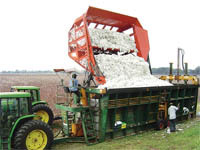 They had sought reductions in us cotton subsidies to establish price stability. The wto ruled against the us subsidies in 2005 saying these violated trade rules by pushing world prices down through excess production. Following this, the us eliminated part of its export-credit guarantees and a programme that paid exporters and us mills to buy cotton grown in the country. However, it failed to cut marketing loans and stipends to its farmers even when cotton prices went below the threshold level specified by the wto. us officials believe the payments comply with international trade rules. Washington is expected to appeal against the ruling, which has come just before the introduction of the us 2007 farm bill. The bill will set agriculture policy, including subsidies, for the next five years. A study by Oxfam shows reforming us cotton subsidies will boost income of African cotton farmers by 6 per cent.